Edinburgh’s new Tonga flanker Viliami Fihaki admits there was a slight confusion when he told his then Sale Sharks team-mate Chris Cusiter that he was heading for Scotland. “It was funny, I told him I was going to Glasgow as my agent was not clear what was going on,” explained the 29-year-old back-row forward. “Chris was happy and he said that was his old club. Fihaki has spent the past two years at Sale but has been behind the likes of Josh Beaumont in the pecking order. He knows he faces a battle with some big names at Edinburgh but believes he will have more opportunities to shine in Scotland. “I feel there is more to learn here than back in Manchester,” said Fihaki. “Sale are a great team, but I was under some players in the England system. So it was hard to get some game time, even though when I did I thought I played well. 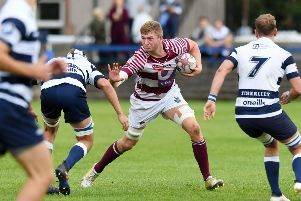 “[Edinburgh coach Alan Solomons] told me to put my best foot forward and if I perform well in training and on game day I will get opportunities. Ironically, his first outing for his new club could come back at Sale on Friday evening when Edinburgh travel to Manchester for a pre-season friendly. Fihaki says he can’t wait to get on the field after a few weeks of “hard but enjoyable” training. Fihaki played with New Zealand provincial side North Harbour for over four years in the ITM Cup before impressing for Tonga – he now has eight caps – in the Pacific Nations Cup three years ago and attracted the interest of Sale. “When I joined them I arrived on a Tuesday and played on the Friday. I got yellow carded, which turned out to be a good thing as I was blowing a bit,” said the Tongan with a smile.